Any content or media that biblically provides insight on the Word of God with deeper studies related to the King Jame Version of the bible. FOUR BLOOD MOONS examines the biblical passages seemingly connected to these events—in Joel and Acts—where it says the “sun will be darkened” and the moon will appear as blood in advance of God’s world-changing action on earth. 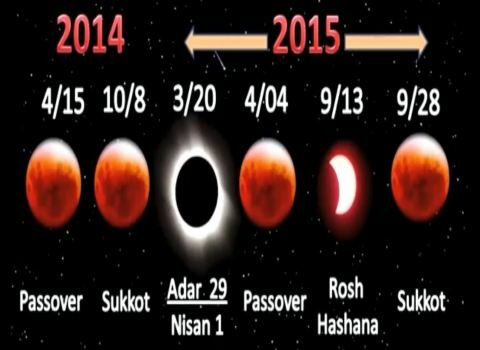 Hagee points out that during this four blood moon cycle, all of which touch on Jewish holy days, a solar eclipse also will occur–a combination of events that will never repeat. Whatever the results, audiences at FOUR BLOOD MOONS will see a compelling and entertaining exploration of these spiritual, celestial and historical events. And they will leave the theater convinced that something is about to change that could impact us all. Well I have completed another bible study recently and I must say this one was fun and I learned some things. I have always wanted to look into angels and after doing the study, it is just another mind blowing part of how awesome and holy God truly is. Through this study I go along-side Dionysius the Areopagite’s Celestial Hierarchy and cross examine it with what I was able to find in the bible. For the bible study, my link is below. God bless! Truly an emotionally and spiritually powerful video that probably just scratches the surface of what the very last days and events may look like. I encourage all when you have time to watch this video that it may convict us to be without spot or blemish upon His return for the Bride! God bless! For those who like to follow my posts please note a lot of extra information that I do on the side can be found on the website for Revelation Unfolding. There is a lot I like to study upon so many may not be completed but please bare with me. I wanted to try and start posting links around every month for the updates which can be found on my welcome page link below. Thank you for those who follow, and feel free to comment on anything. Communicating and sharing with each other in Christian fellowship, I believe is also one of the ways that allows us to grow in Him. God bless! About a week ago I was doing some research on music and came across this very informative paper written by Dr. Juanita McElwain. In a nutshell this paper mentions how music can be very deceptive beyond our recognition and spiritually attack and even lead to the possibility of demon possession. This is not to be taken lightly! We have a lot of wolves in sheep clothing in this day and hour. I encourage you to study into the what music you listen to; look into the lyrics, watch their music videos and keep an eye out for symbolism, look into their album artwork for symbols, try to see if you can listen to the music backwards for subliminal messages, and even look at the person(s) bio. You never know what God may show you. Ultimately pray and ask God to inform you and help with discernment. I have covered this area before in some research and found out surprising results! Just ask and I can share or browse my page and posts. God bless! We already witnessed a war between Israel and Hamas in 2014, but personally I am convinced that more war could soon come to the Middle East. For much, much more on this, please see this article. Of course Jewish tradition is not Scripture, but it is very interesting to note. And what we do know is that we have seen this kind of pattern before. On Nisan 1 in 70 AD, there was a total solar eclipse. But that was not the only eclipse during that time period. In fact, there were a whole series of eclipses that took place on key Biblical dates before and after the destruction of the Temple in Jerusalem. Now we find ourselves in the middle of a similar series of eclipses. So could it be possible that this total eclipse on March 20th is a sign of judgment? Or is all of this just a giant coincidence? Either way, at least now you understand what so many people are talking about.